If you’ve read this book and think you’d like a Newfoundland dog of your own, I strongly urge you to reconsider. Every year hundreds of giant breed dogs are put up for adoption or worse, destroyed because someone fell in love with the fluffy little puppy and brought it home, only to be overwhelmed by slobber, food, vet bills, and the sheer size of their full grown dog. If you cannot make a commitment to this – or any – animal to keep it forever, then please don’t get one. Would you give up a son or daughter because they got too big? Certainly not. 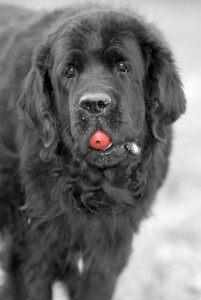 Anyone who thinks a Newfoundland is any less than a child doesn’t understand the breed. Breeders ask a lot of questions to see if you are capable of being responsible for a Newfie. They don’t want to see their pups end up in shelters two years from now. The scene where I describe being grilled by the breeder really happened. When we started talking to rescue, they were even more insistent that we be the right kind of people. Newfoundlands are beautiful dogs. They also love water. They will get into water any way they can. They like to sit in the rain, dig holes in the mud, wade through streams and sit in the water they spilled from their bowls. They don’t care where the water is, and having a puddle of water on the kitchen floor can be just as satisfying as swimming in the ocean. Our Daisy wouldn’t drink from a bowl unless her feet were in it first. Can you handle this in your house? You better be able to with a Newfie around. Many of the pictures I took of Cozy were taken after grooming and bathing, which by the way is no small task. Ever try to brush a 100 pound animal that just doesn’t want to be groomed? Pictures and movies that include dogs usually show only a well groomed animal. In reality, Cozy was clean about 40-50% of the time. The other 50-60% of our lives were spent cleaning her, cleaning up after her, or listening to my wife mopping the kitchen floor for the 3rd time that day. Make no mistake; Newfs are sloppy dogs. Do you like drool? If you’re considering a Newfie, then you better love the stuff, because Newfies drool. Dry mouthed Newf you say? Hogwash I say. Sure some Newfies drool less than others, but there are no guarantees. Will you put you dry-mouthed Newf in the pound when he slobbers all over Aunt Edna after a big drink? Get a hamster instead. We used to have a beautiful green carpet. Within a year of having Newfs we had to rip it out. Do you like fur? Do you like fur in your butter or in your ice cream? How about in the sink, on your bed and up your nose at work? Newfies shed constantly. The plus side is that this is only 12 months out of the year, but they blow coat twice a year resulting in dog-sized piles of fur. Prepare to vacuum, friend, and if you don’t have a good vacuum you will either buy a really good one, or buy a lot of cheap ones. Don’t get me wrong. Newfies are the most loving dogs I have ever had the pleasure to be with. They are by far the best pets in the world. They have some serious drawbacks though, and most people don’t appreciate them at first. Please, if you want a Newfie, go visit a reputable breeder like we did. You must sit and play and be slobbered by these magnificent creatures before you can begin to get a feeling for what you’re in for. How do you know if a breeder is reputable? Call other Newfie breeders and ask around. Newfie breeders generally work together and will generally know a lot about one another’s programs. If you go to a breeder that has nine different breeds all with puppies, run away. This is probably a puppy mill. Puppy mills cause unfathomable suffering for countless dogs. Please don’t patronize them. Since most puppy stores get their dogs from these puppy mills, please don’t patronize them, either. If you’ve gotten this far and haven’t been offended or angered by what I’ve written, then perhaps you are the right kind of person for a Newfoundland dog. Go buy some books, talk to some breeders and visit some Newfies. If you truly are Newfie-people, your life will change forever. It will be significantly wetter, furrier and messier to be sure. If you can handle the mess, you are worthy of the love. Every Newf deserves a great life — a cozy life. we have 2 newfies one 6 and one 7. They are landseer newfies and the loves of our life. Never leave them outside…never!!!!! !